I’ve just discovered a great website called The Political Compass. If you’re not entirely sure where you sit within the political spectrum, left or right, authoritarian or libertarian, take their test, you’ll find it interesting. They show you where the political parties of the U.K. sit relative to this scale, and each other. It’s very enlightening. One thing that stands out for me is that nearly all of the political parties err on the side of authoritarianism, which goes some way towards explaining why I have such a hard time deciding who to vote for as, for me, there is no-one, apart from the Greens – and I’m not especially environmentally conscious (it doesn’t really sit with being a motorsport fan). I’ve transposed my graph with the political parties and political figures to see where I sit. I appear to be especially liberal, which is nice, though I must admit I expected to be more to the right, economically, but it appears not. 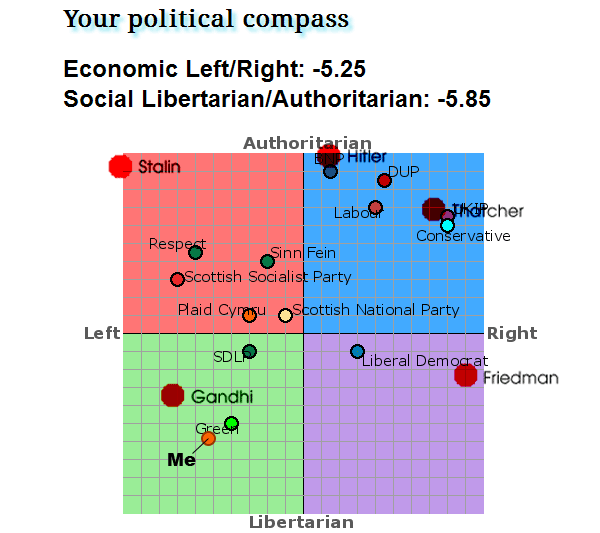 Either way, I’m quite a distance from Hitler and Thatcher, which suits me fine! Give it a try and let me know your figures.